The first project is an untitled modern day spy vehicle for Tom Cruise. Also involved are Joel Surnow and Michael Loceff, two of the main writer/producers of tv's 24 (hopefully it ends up closer to seasons 1 and 5, as opposed to seasons 2 and 6). The other project is apparently Mel Gibson's return to acting. Mel Gibson of course, four years of controversies aside, hasn't acted in a mainstream film since Signs, back in 2002. This will be a remake of the 1985 British mini-series Edge Of Darkness (which Campbell helmed back in the day). Also on board is William Monaghan, writer of the remake of The Departed (great dialogue, fun movie, but full of plot holes and illogic) and Kingdom Of Heaven (an underrated masterpiece, whichever version you watch). Martin Campbell has been one of the very best action directors for the last fifteen years. Goldeneye is still the very best non-Connery Bond film (and Casino Royale is the second), and The Mask Of Zorro is one of the best superhero films ever made. I even enjoyed Campbell's lighter, sloppier sequel (2005's The Legend Of Zorro), which substituted knotty questions of family identity and class for the original's classic hero myth making. Unlike 90% of action directors, Campbell knows how to shoot wide, cut only when necessary and create a complete sense of geography. And, even in B-level fare like Vertical Limit, the action is character driven and the violence has a sense of sorrow. Oh, and back in 1993, he directed one of the very bests episodes of American television ever, the "Three Men And Adena" episode of Homicide: Life On The Street, so he's got that going for him too. These projects are almost certainly a better use of his talents than his next gig, a remake for Platinum Dunes of The Birds (granted, The Birds is one of Hitch's lesser films, so a remake has interesting possibilities). Either way, it's good to know that he'll be cranking out quality product for the foreseeable future. For the record, if a rival executive tells you that someone else's movie is going to break records on its opening weekend, don't believe them. In the same way that politicians inflate the expectations of their rivals in a primary, convention, or general election, studios often use the media to create unrealistic expectations of how someone else's movie will perform. To wit - anything over $70 million for Iron Man is a huge win, especially as the reviews are positive, so it should have some breathing room before Indy 4 (Speed Racer is a huge question mark and Prince Caspian is chasing a different demo). Anything under $50 million is a disappointment and cause for concern for franchise potential. This is the best slot to open your summer movie - period. Even with bad reviews and bad pre-release buzz, Universal's Van Helsing still pulled in $52 million in this slot back in 2004. But Marvel comic book movies are not sequels to each other. In the same way that Madagascar was not a sequel to Shrek 2 (if you recall, analysts went crazy because Madagascar opening on Memorial Day Weekend 2005 to 'only $65 million in four days', 'less than half of Shrek 2's opening five day figure!! '), Iron Man is not Spider-Man 4. Anyone who is expecting Iron Man do to over $100 million is either lying or overly optimistic. Could it do such a number? Of course, it COULD. Despite the 'no girls allowed' nature of the marketing, Downey Jr is the ultimate 'rebel in need of saving' for many women. And, of course, you need both sexes to do anything over $40 million. If the Downey factor is enough to draw in willing females (as opposed to begrudging girlfriends and women who like big metal toys as much as boys), then X2 numbers are not out of question ($85 million on this same weekend in 2003). For the record, I'm not one who believes that Grand Theft Auto IV is going to make a major dent in the numbers. The game came out yesterday and gamers have to take a break sometime this weekend. Besides, what about the much anticipated release of Mario Kart Wii? Or will that be the alleged cause if Speed Racer under performs next week? But, it could make a small impact, perhaps the difference between doing $75 million and $85 million. There are plenty of adults who bought the game yesterday but will be too busy with jobs and family to play it before the weekend. Point being, as the summer begins, let us try to keep perspective and be realistic about what movies will open to how much. $100 million+ would be an ungodly triumph for Paramount/Marvel, but don't believe the Monday-morning quarterbacks who snicker at $65 million. Much has been written about a trailer mash of Burton's original 89 Batman, which makes it resemble (superficially) the first full-length Dark Knight trailer that came out back in December . While it's a pretty sloppy job (there is no audio for the Burton trailer because the dialogue is completely different), it does bring up a question of expectations and accolades. Moviegoers and critics have short memories. So, once July 18th falls upon us, one can likely expect countless articles and reviews discussing Heath Ledger's Joker performance as something groundbreaking and different. Maybe it will be. Truth be told, it'll still likely have an annoying aftertaste, since I'm pretty sure that there are plenty of other actors who could have done something interesting with this iconic character without killing themselves in the process. But Legder is not the first person to play The Joker as a heartless mass murderer. Heck, even if The Dark Knight is the PG-13 bloodbath that some fans are hoping for (keep hoping - Chris Nolan's movies are all relatively restrained in their violence and he has hinted the same in interviews about this one), that in itself won't be groundbreaking either. For all the hub-bub about how dark and violent The Dark Knight is supposed to be, we all forget how insanely violent the original Burton Batman was in 1989. We have an onscreen or mentioned off-screen body count near the triple digits, mostly all civilians and cops, and three scenes of mass civilian crowds being slaughtered f or sport (the machine gun massacre at the city hall steps, the gassing of the museum, and the climactic gassing of the party goers). Throughout the running time, countless people are shot, stabbed, electrocuted, poisoned, and blown up. If we recall, the film caused a minor stir back in 1989 for its darkness, ghoulishness, and violence. This was the first major comic book film to be rated PG-13 and there was much debate as to whether a film about Batman should be technically inappropriate for kids (remember, the PG-13 had only been around since 1985). Ironically, short memories struck again, with the release of 1992's Batman Returns. That film caused a MAJOR debate about it's graphic violence, sexual content, and overall gloominess. All of these people had seemed to have forgotten that Burton's original wasn't exactly a remake of the 1960s TV show. That controversy had, in my opinion, earth-shattering repercussions for the film industry, but that's for another day. Health Ledger is not the first Joker actor to portray him as a heartless mass murderer. Heck, if you count Mark Hamill* (still my favorite onscreen Joker, playing the role perfectly from 1992 to 2003), Ledger is the third. He may be terrific, but he'll have to do something more than kill people and laugh about it to be truly groundbreaking. And, so will the movie itself. Hopefully, both will prove true. 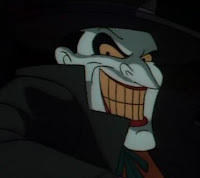 *Pointless trivia - Hamill barely killed anyone on the original Fox Batman: The Animated Series run (1992-1995), but played the character creepily enough for you to presume that he was bumping people off left and right offscreen (he did commit onscreen murder in the terrific 1993 theatrical film: Batman: Mask Of The Phantasm). When the show went to WB (1997-1999), the gloves came off with the show's violence allotment and Joker and the other rogues started killing people onscreen. Heck, in the Batman/Superman cross-over 'World's Finest', he hijacked a giant Lexcorp plane and blew up about a dozen packed skyscrapers in downtown Metropolis. And, truth be told, I'd be shocked if Ledger's Joker did anything as horrifyingly cruel as what Mark Hamill's Joker does to Tim Drake in the 2000 direct-to-DVD film Batman Beyond: Return Of The Joker (especially in the uncut version, which was released in 2002).